After nearly a decade as @HbgSenators beat writer for The Patriot-News and @PennLive, I decided in the fall it was time to step away…I may still make a few visits to City Island, but the addition of high school football to my beat coverage last year greatly impacted my decision. When I was granted press credentials in 2011, Geoff could have easily shunned me or treated me with a healthy dose of disdain. After all, here I was just some punk who wrote stuff on a blog and somehow had lucked into full access to the Senators. But the professionalism and friendship he offered was much more than one could ever hope. Even though I knew baseball backwards and forwards, I had absolutely no idea how to conduct myself around coaches and players in the locker room. I don’t think I asked manager Tony Beasley a question until at least May or June. But I stuck as close to Geoff as I could to try and pick up as much as I could. That season PennLive also had Andy Shay at Metro Bank Park most nights and between the two of them I felt like I learned everything from a Journalism 101 course through a Master’s level degree. Fast-forward to the 2014 season and I still rarely left Geoff’s side. If you happened to see him walking around the concourse or chatting up a player, I was usually a half of a pace behind him still being taught lessons after four years. You know how you go to your favorite bar, and your local bartender isn’t there? You ask, “Where’s Jeff?” “Jeff no longer works here, I’m Steve.” And you’re thinking, “Hey, who’s this idiot? I like Jeff.” But you still want your drink? And even though Steve doesn’t mix your drink the same way you’re used to, like Jeff, you still like the same bar, you don’t want to have to go to a different bar. And even Steve might feel kinda bad because Jeff trained him. Jeff showed him how to work the cash register, where the tonic was on the soda gun, who tips, who doesn’t….Well…I’m Steve. What can I get you? You may be asking yourself why you just read that story. Well that pretty much sums up my feelings as I let everyone know that I’ll be taking over the beat writer duties for the Senators this season. The amount of respect I have for the previous beat writers Skip Hutter, Andy Linker, and Geoff is immeasurable. I only wish I can live up to the example and standards they have set over the years. I hope my love for the game of baseball and appreciation for those that play it comes across in my writing. So, if you have any questions, recommendations, or issues about the coverage, please hit me up at any game, e-mail me at mickreinhard@gmail.com, or tweet at me @Mayflies. I would love to hear from all of you as we both make this transition into uncharted territory this summer. 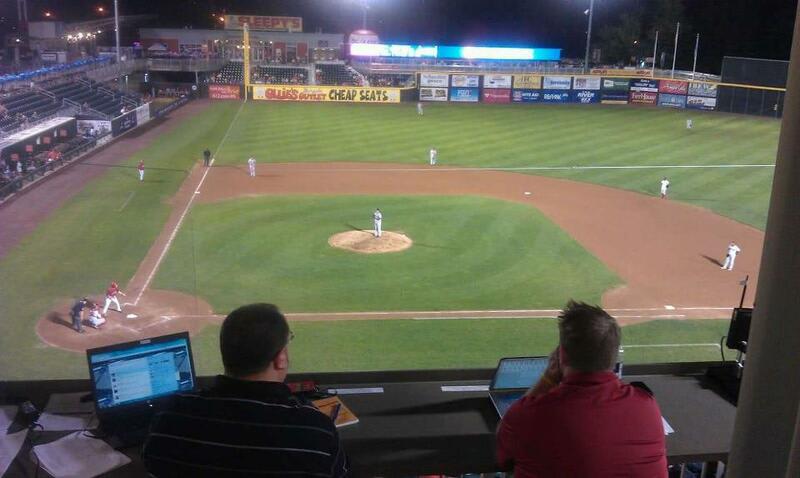 This entry was posted in Uncategorized and tagged Geoff Morrow, Harrisburg Senators, Patriot-News, PennLive. Bookmark the permalink. 2 Responses to What can I get you?